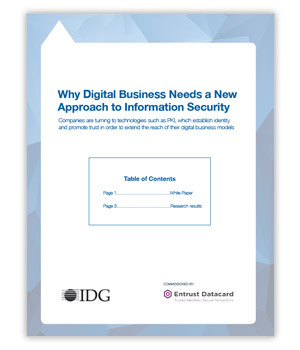 The needs of digital business are raising the profile of identity and trust as information security priorities. And as companies progress toward becoming fully digital, they are shifting their thinking about the role of identity management in their businesses. This research report from IDG looks at these trends and explores why companies are turning to technologies such as PKI, which establish identity and promote trust in order to extend the reach of their digital business models. GET YOUR FREE RESEARCH PAPER NOW!